The Danish energy demand is met by domestic natural gas resources and oil, coal imports, and domestic renewable energy sources such as waste, woodchips, wind and biogas. There is no large hydropower or nuclear power production in Denmark. The first oil and gas exploration licence was granted in 1935, and since then oil and gas have been exploited in Denmark. In 1966, hydrocarbons were discovered in the North Sea, and in 1972 the first oil was produced. During the first 50 years, exploration of oil was carried out under sole-right concessions, but in 1983 competitive licensing rounds were introduced and the first licences with more than one concession holder were awarded in 1984 – the latest in 2016. Oil and gas activities are governed by the Subsoil Act,2 which lays down the basic framework for oil and gas exploration and production. The first comprehensive legislation governing electricity supply entered into force on 1 January 1977. Electricity activities are mainly governed by the Electricity Supply Act,3 which lays down the basic framework for electricity production and supply. The aim has been to ensure electricity supply in accordance with the principles of security of supply, economics, and environmental and consumer protection. Access to cheap electricity and consumer influence on the administration of electricity sector assets; promoting sustainable energy use, including in connection with energy savings and use of combined power and heating; lasting and environmentally compatible energy sources, as well as securing effective use of financial resources; and creating competition on the markets for production and trade in electricity are essential elements in the legislation. The long-term goal of Danish energy and climate policy is to have the total energy demand covered by renewable energy by 2050. The total share of renewable energy in electricity consumption is expected to be approximately 80–85 per cent in 2020 and for district heating consumption approximately 95 per cent. Wind power alone is expected to cover up to 53–59 per cent of electricity consumption in 2020, compared with approximately 43 per cent in 2017. The overall administrative responsibility for the energy sector lies with the Danish Minister for Energy, Utilities and Climate (the Minister).4 Part of the Minister's authority has been delegated to the Danish Energy Agency (DEA).5 The DEA is responsible for the entire chain of tasks linked to energy production and supply, transportation and consumption, including energy efficiency and savings as well as national carbon dioxide targets and initiatives to limit emissions of greenhouse gases. In cooperation with the Minister, the DEA prepares the majority of the bills and other political proposals. The DEA carries out analyses and estimates of the development in the energy sector and represents Denmark in international forums. The Danish Energy Regulatory Authority (DERA)6 controls prices and conditions in the energy sector. DERA's purpose is to ensure an efficient and transparent energy market in Denmark. Transmission, storage and distribution undertakings and supply-committed undertakings are under the supervision of the DERA. Decisions of DERA may be appealed to the Energy Board of Appeal.7 Decisions by the Energy Board of Appeal cannot be brought before any other administrative body, but may be challenged before the courts. Energinet,8 a state-owned undertaking, owns, operates and develops the Danish transmission network for electricity and gas and is responsible for effective and safe supply and for a competitive energy market. Energinet must ensure open and equal access to the transmission networks for all users. It also issues rules on gas transport and coordinates the general planning of emergency supply for the natural gas sector. The city councils in the municipalities are responsible for the planning of local heat supply.9 In each municipality, the city council must carry out planning in cooperation with the supply undertakings and other stakeholders. The heat planning procedure ensures public participation, and as part of the heat supply planning, the city council may decide that connection to a collective heat supply system should be mandatory. The Energy Supplies Complaints Board is a private board established by the energy industry and the Consumers' Council. The Energy Supplies Complaints Board handles complaints about the purchase and delivery of energy from supply undertakings. As a principal rule, the board only accepts complaints from consumers. Decisions of the Board cannot be appealed to any administrative authority, but can be brought before the courts. A permit is required for the establishment of plants and for expansion or changes to such plants causing increased pollution.18 Permits are issued by the relevant city council or regional council depending on the size of the plant. Permits for major plants require a prior public hearing, and for major plants there may be a duty to complete an environment impact assessment under the Planning Act.19 Offshore plants are primarily subject to approval under the Subsoil Act and Continental Shelf Act. Offshore installations are subject to approvals and permits issued by the DEA. These include operation permit, manning and organisation plan approval and approval for the contingency plan. To obtain an operation permit, there must be an evaluation of safety and health conditions for the installation and the operational conditions (health and safety review/safety case) and other relevant information regarding health and safety conditions (e.g., certificates). Offshore installations operating in Denmark must have a workplace assessment system. The Danish state has a general right to all hydrocarbons in the subsoil of the Danish territorial jurisdiction area. The state can grant licences for preliminary investigation, exploration and production of hydrocarbons. Licences are granted through tender procedures or under the 'open door' procedure. The main part of the natural gas on the Danish market is produced in the Danish North Sea. Through the Danish North Sea Fund, the Danish state participates in concessions for exploration and production of hydrocarbons. The fund is administered by the Danish North Sea Partner, a unit under the Ministry. The fund, which was established in 2005, is the Danish state's oil and gas company, which contributes to the decision-making processes in connection with exploration, production and development activities with respect to Danish licences. The aim is to use existing knowledge across licences and support the development of new technologies that can enhance the recovery rate of oil and gas resources in the subsoil. Partly state-owned Ørsted A/S (previously DONG Energy) owns upstream pipelines and operates the gas treatment plant at Nybro. The establishment and operation of upstream pipeline networks require a licence issued by the DEA. Any interested party is entitled to access an upstream pipeline network subject to payment. The physical planning of the system for supply of natural gas is governed by the Heat Supply Act. Establishment of new distribution network facilities for natural gas and major alterations to existing facilities requires approval from the relevant city council20 and, in certain cases, the DEA. A storage undertaking is obliged to place storage capacity at the disposal of Energinet, but only to the extent necessary to enable Energinet to maintain physical balance in the network and to ensure security of supply. A storage undertaking must grant access to the storage facilities on the basis of objective, transparent and non-discriminatory criteria. The Danish market for natural gas was fully liberalised on 1 January 2004, and since then customers have had a right to choose a natural gas supplier. Anybody may in principle establish a natural gas supply undertaking. Electricity grid undertakings have a monopoly on the distribution in their areas and are governed by the Electricity Supply Act. The transmission system operator (Energinet) is responsible for the general security of supply in Denmark and must ensure the overall balance and quality of the electricity supply system. Also, the operator must ensure players have access to the transmission system on objective, fair and transparent terms. Electricity supply undertakings supplying electricity on commercial terms are generally not governed by the Electricity Supply Act. Natural gas and electricity licences, where applicable, can only be issued to applicants with the necessary expertise and economic capacity. The licence can neither directly nor indirectly be transferred to others without approval by the DEA. A gas distribution network or shares in companies that own distribution networks are generally only allowed to be transferred to the state. The state, on the other hand, has a duty to buy. The state must exercise its duty to buy within three months of the date of notification of the owner's wish to dispose of the distribution network or the shares. If the parties cannot reach an agreement on the conditions of the transfer, the prices and terms of the transfer will be fixed by a valuation commission in accordance with the procedure that applies to compulsory sale to the state.21 In 2016 and 2018 the Danish state purchased two out of the three large gas distribution networks in Denmark. The state is in negotiations with the owner of the third and largest gas distributions network regarding a purchase to finalise a consolidation of the sector. Since 1998, Danish competition legislation has been strongly influenced by EU competition law, but the Danish rules are generally stricter than those of the EU in terms of support for free competition. The level of unbundling in Denmark generally exceeds the requirements of the Electricity and Gas Directives. Through the establishment of Energinet, Denmark has secured ownership unbundling of the main transmission grid. In the electricity and natural gas industries, there is a requirement for legal unbundling in relation to the parts of the value chain of monopolistic character. The Natural Gas Supply Act requires a company with a licence for transmission, distribution, storage, LNG business or universal service obligations to conduct only activities allowed under the licence. As a general rule, the Electricity Supply Act does not allow grid and transmission licences to be issued to the same company. Undertakings producing electricity by means of waste incineration are not allowed to carry out other types of electricity production or trading activities. The requirement for unbundling of activities does, however, not preclude the use in combined waste incineration plants of other types of fuel (e.g., straw, chipped wood or natural gas) together with waste suitable for incineration. The requirements are supplemented by demands for managerial unbundling in the Electricity Supply Act and in the Natural Gas Supply Act. To prevent conflicts of interest, executives and managers of a distribution undertaking must not directly or indirectly participate in the operation or management of an associated undertaking selling or producing natural gas or electricity, or participate in an associated undertaking that indirectly owns such an undertaking. Members of the board of directors of distribution undertakings must not directly or indirectly participate in the operation or management of associated undertakings selling or producing natural gas or electricity. Danish law allows full access on a non-discriminatory basis to the transmission and distribution systems in both the natural gas and electricity sectors. The transmission network for natural gas is connected to the natural gas transmission networks in Germany and Sweden. The transmission network is connected to the distribution network to which the end users are connected. There is a general right to use the transmission network against payment of applicable fees. Access can be denied if the transmission undertaking cannot meet the capacity requirements, cannot ensure the quality of the natural gas, cannot ensure security of supply, cannot ensure sufficient quantities of natural gas, or if a natural gas undertaking has severe economic and financial difficulties with fulfilling contracts (including take-or-pay commitments). Access can also be denied if a natural gas undertaking does not comply with the access requirements laid down by the transmission undertaking. Reasons must be given for denial of access, and a denial of access can be brought before the DERA. The transmission grid for electricity is the part of the electricity grid that transports electricity to local grid undertakings, which then distribute the electricity to end users. The transmission grid also transports electricity to and from other countries. The transmission grid is owned and operated by Energinet,22 which is responsible for the security of supply and the overall balance and quality of the electricity supply system. Energinet is also responsible for the overall planning and development of the transmission system. Energinet must ensure that players have access to the transmission system on objective, fair and transparent terms. The grid undertakings deliver electricity from the transmission grid to individual end-users. Each owns and operates a distribution grid within a local supply area. Grid undertakings have a monopoly on the distribution within their area. However, the grid undertakings must ensure that players have access to the grid on objective, fair and transparent terms. The storage facilities for natural gas are currently situated at two locations in Denmark: Stenlille and Lille Torup. The two gas storage facilities are owned and run by Energinet. It is a general rule that access to transmission and distribution grids must be provided on the basis of objective, transparent and non-discriminatory criteria. When setting prices, grid undertakings must not discriminate between users. Transmission and grid undertakings must prepare a plan for internal supervision and describing the undertaking's measures to prevent discriminatory practices. Prices must be based on the undertaking's costs and a reasonable return on capital invested by the undertaking. Undertakings that sell oil in Denmark must keep oil reserves in storage ready for emergency use by the Danish state. Denmark's obligations to maintain such oil storage follow from an EU directive and from rules laid down by the International Energy Authority. The Danish Act on Emergency Oil Supplies23 ensures emergency supply in the event of disruptions or threats in the oil sector, including keeping reserves of crude oil and petroleum products, and collecting data on the oil conditions in Denmark. The Danish emergency oil management system is primarily handled by the Danish Central Stockholding Entity, which is an independent organisation set up by the oil companies and appointed by the DEA. Nord Pool Spot runs a power market in northern Europe and offers both day-ahead and intraday markets; 380 companies from 20 countries trade on the market. Nord Pool Spot is owned by the Nordic and Baltic transmission systems operators (in Denmark, Energinet). In 2017, the group had a total turnover of 512TWh. The power price is determined by the balance between supply and demand. Factors such as the weather or power plants not producing to their full capacity may have an impact on how much power can be transported through the grid and may therefore influence the price of power. The Minister can decide that oil undertakings must submit information on the conditions of import, export, production, sale, storage and transport, and on other general matters. The Minister can stipulate that undertakings producing or importing oil must sell oil in accordance with international distribution schemes. The liberalisation of the gas market on 1 January 2004 meant that all natural gas customers would have a free choice of supplier. Any party can establish a natural gas undertaking supplying natural gas, provided that it enters into agreements with the relevant transmission, storage (if needed) and distribution undertakings. An undertaking trading in natural gas can sell its products on market terms. Natural gas suppliers may be licensed as a supply-committed undertaking in areas designated for natural gas pursuant to the Heat Supply Act, with the effect that the undertaking has the right and duty to supply natural gas to all customers within the area that have not used their right to choose an alternative gas supplier. The undertaking may deny supply of natural gas to a customer that does not pay for the deliveries. Sale and delivery of electricity to end-users are made by electricity suppliers, which are either supply-committed undertakings or undertakings supplying electricity on commercial terms. Supply-committed undertakings deliver electricity to consumers who have not exercised their right to choose an alternative supplier. Most power in the Nordic and Baltic region is traded on Nord Pool Spot. Natural gas, on the other hand, is still primarily traded through bilateral contracts, although an increasing quantity is traded at the market exchange Gaspoint Nordic. Danish energy legislation generally only regulates end-user contracts. There are a large number of new energy policy initiatives seeking to accelerate the transition to green energy. The four critical focus areas are: energy efficiency, electrification, expansion of renewable energy and research, and development and demonstration. Denmark has a long tradition of active energy policy, initiated by the first oil crisis in 1973. When oil prices accelerated in 1973, Denmark was among the OECD countries most dependent on oil in its energy supply, with more than 90 per cent of all energy supply deriving from imported oil. Denmark launched an active energy policy to ensure the supply and enable Denmark to reduce its dependency on imported oil. In combination with oil and gas production from the North Sea, Denmark went from being a net importer of oil in 1973 to being more than self-sufficient in energy from 1997 and beyond. In the Kyoto period 2008–2012, Denmark committed itself to a greenhouse gas reduction target of 21 per cent. Today, renewables account for more than 40 per cent of Danish electricity consumption and, through expanded offshore wind production and use of biomass, the government expects that renewables will reach almost 70 per cent of Danish electricity production in 2020. A new political agreement between the government and all the major opposition parties was reached in March 2012. The agreement covers the period 2012–2020 and sets out the following goals: more than 35 per cent renewable energy in final energy consumption, approximately 50 per cent of electricity consumption to be supplied by wind power, 7.6 per cent reduction in gross energy consumption in relation to the 2010 level and 35 per cent reduction in greenhouse gas emissions in relation to the 1990 level. Energy taxes on electricity and oil were introduced in 1977, and since then taxes have been increased several times and have also been extended to coal and natural gas. In 1992, the taxes were supplemented by carbon taxes. Other means of achieving renewable energy are heat-savings initiatives in buildings, use of renewable energy in buildings, municipal heat planning, energy-efficient electricity and district heat production, and use of renewable energy in electricity and district heat production, plus energy savings and use of renewable energy in industry and transportation. Wind turbines have been supported politically for many years, including through state subsidies, feed-in tariffs, orders to the electricity utilities to build wind turbines, tenders for offshore wind farms and orders to the municipalities to allocate suitable areas for new onshore wind turbines. Approximately 40–45 per cent of electricity is currently produced by wind turbines (and this is expected to exceed to 50 per cent in 2020). In 2009, the Promotion of Renewable Energy Act24 was launched to promote the production of energy through the use of renewable energy sources, in accordance with climate, environment and macroeconomic considerations, to reduce dependence on fossil fuels, ensure security of supply and reduce carbon emissions and other greenhouse gases. appliance and components – covering electrical appliances and components not directly related to industrial use. The Danish strategy for energy-efficient technologies provides a framework for prioritisation and development of research and development efforts to achieve the greatest possible impact by public funds used in the field. The government introduced a new scheme where solar and wind power projects compete through tenders for state subsidies in 2018 and 2019. The total pool under the scheme is 1.165 billion kroner, of which 1.015 billion kroner has been allocated towards a technology-neutral call for a wind and solar power tender and 150 million kroner for new test windmills on land. The aim is to achieve the highest possible capacity for the allocated amounts by increasing competition between the technologies. It is expected that the 1.015 billion kroner will result in approximately 190MW of sustainable energy, which corresponds to the annual power consumption of approximately 140,000 households. It is also expected that approximately 130MW test windmills will be built in 2018 and 2019. 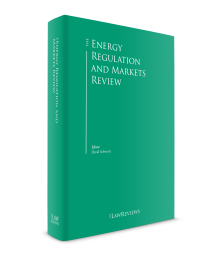 Amendments to the Energy Supply Act per 1 January 2018 introduced changes to the financial regulation of grid companies. The new rules govern the prices that electrical grid companies can charge consumers in order to cover the costs of running the grid, including return on investments and depreciations. A five-year regulation period with annually updated revenue frameworks has been introduced, aiming to provide better regulatory security than the previous regulation. In June 2017, the government entered into an agreement in principle with the owners of two of the three natural gas distribution networks in Denmark, HMN Naturgas and NGF Nature Energy, on the framework for a consolidation of the gas networks in Denmark under a state-owned entity. The state had (through Energinet) already purchased the third part of the distribution network from DONG Energy in 2016. Following the agreement, the state entered into a purchase agreement in March 2018 concerning NGF Nature Energy's distribution network. Negotiations regarding the purchase of HMN Naturgas' distribution network is ongoing. Both Ørsted (DONG Energy) and Maersk sold their oil and gas activities during 2017. In May 2017, Ørsted announced that it had agreed to sell its oil and gas business to petrochemicals firm Ineos in order to focus its activities on renewables, and in August 2017 Maersk Oil announced that they were selling their activities in the Danish part of the North Sea to French Total, which thereby became the leading operator in the Danish North Sea. Denmark is continuously increasing its focus on renewable energy with the aim of being an international leader in the area and ensuring self-sufficiency. There is a large focus on cost-effectiveness and ensuring cheap energy for consumers while maintaining incentives for new investments in the sector. 1 Nicolaj Kleist is partner at Bruun & Hjejle. 2 Act No. 960 of 13 September 2011 on the Use of Danish Subsoil. 3 Consolidated Act No. 114 of 9 February 2018 on the Supply of Electricity. 8 Established by Act No. 1097 of 8 November 2011. 9 Act No. 523 of 22 May 2017. 10 Act No. 1101 of 18 November 2005. 11 Act No. 124 of 26 January 2017. 12 See footnote 2, above. 13 Act No. 277 of 25 March 2014. 14 Act No. 1157 of 6 September 2016. 15 See footnote 9, above. 16 See footnote 3, above. 17 See also Section III.iii, below. 18 Act No. 966 of 23 June 2017. 19 Act No. 50 of 19 January 2018. 20 There are 98 municipalities (city councils). 21 Act No. 1161 of 20 November 2008 on the Procedure for Compulsory Sale of Real Property. 22 See footnote 8, above. 23 Act No. 354 of 24 April 2012 on Emergency Oil Supplies. 24 Now Act No. 119 of 9 February 2018 on the Promotion of Renewable Energy.